For more than four hundred years, hockey has been a popular field sport in Europe and the British Isles. In the 1600s, it was known as "shinny" in Scotland, "hurley" in Ireland and "hocquet" in France. The Irish struck brass balls at their opponent’s goal, using heavy shillelaghs in bloody competitions, after which the losing players were sometimes killed by the winners. When the English winters froze the flooded marshlands, the hearty English lads in the village of Bury Fen took to the ice in the early 1800s to extend their field hockey season with a game that they called "bandy." Their puck was then a cork or wooden ball which they called the "cat" for reasons probably best left undiscovered. Bandy sticks were crafted from branches of nearby willow trees and were often passed on from generation to generation. In Holland, meanwhile, the Dutch, whose great paintings of the 1600s and 1700s sometimes showed players on land or on ice striking a ball with a stick toward a target, were developing the first ice skates in the mid 1800s. This Dutch innovation propelled ice hockey into the world’s fastest team sport. British troops assigned to Canada first brought hockey to North America. 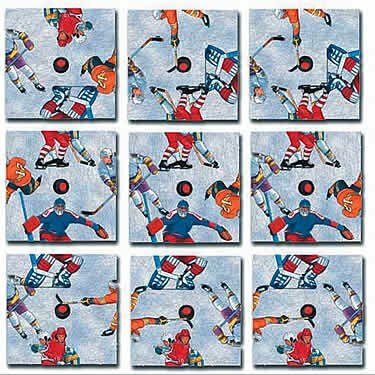 Today, 1" thick by 3" diameter vulcanized rubber hockey "pucks," frozen solid before the games, travel at speeds of over 100 mph off of hockey sticks swung by speed skating players avoiding body checks from their bruising opponents. Games are played on rinks 200’ long by 85’ wide, surrounded by boards 43" high. Glass or wire extends above the boards to prevent a careening puck from changing the appearance of a spectator. Six players skate for each team– a goal tender, two defensemen and three forwards called a right wing, center and left wing. Only the goalies, protecting their 4’ high by 6’ wide goal posts and nets, remain on the ice for the entire game. The rigors of chasing the puck and the opponent requires the other skaters to rotate during the nonstop action in approximately two minute shifts, two shifts of defensemen and three shifts of forwards.